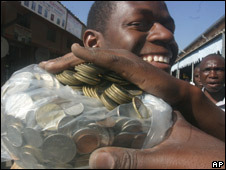 Zimbabwe's central bank has revalued its currency in an effort to control the effects of hyperinflation. The bank is striking ten zeros off Zimbabwe dollar bank notes, making 10bn dollars now equal to one dollar. Reports from the capital, Harare, say long queues have formed outside banks as people seek to withdraw money. The move comes in response to an official inflation rate of more than 2,000,000%, although it is believed the true figure is at least 9,000,000%. The currency revaluation is intended to make business transactions easier for Zimbabwean retailers who increase their prices several times a day to keep up with inflation. Computers, electronic calculators and automated teller machines at Zimbabwe's banks have difficulty handling basic transactions in billions and trillions of dollars. "Other than making it easier for us to count and to carry around, our problems have not gone away," Lameck Chamunorwa, a 28-year-old shop cleaner, told Reuters news agency as he left a bank in Harare. "It's like we are pretending that things are getting normal when the truth is that they are doing this because we are in a bad state and far from normality." The BBC's Southern Africa correspondent Peter Biles says the changes to the currency are a largely cosmetic move that will not stabilise the Zimbabwean economy. The new set of notes, from Z$1 to Z$500, will circulate alongside the higher-denominated currency which is being phased out by the end of the year. Coins are also being reintroduced - after being obsolete for years. 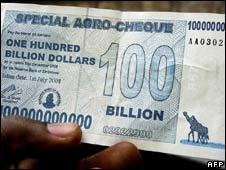 Only recently, the government introduced the Z$100bn note, which was still not enough to buy a loaf of bread. Reserve Bank Governor Gideon Gono said Zimbabweans "must realise the country is practically in a state of socio-economic emergency". "As such, there is need for a universal moratorium on all incomes and prices for a minimum period of six months," the state-run Herald newspaper quoted Mr Gono as saying. He has repeatedly called for price and wage freezes in the past, as he battles to control inflation. Our correspondent says that for most Zimbabweans there is an atmosphere of resignation and misery. There is little to buy in the shops and there are chronic shortages of food, medicine, electricity and water.